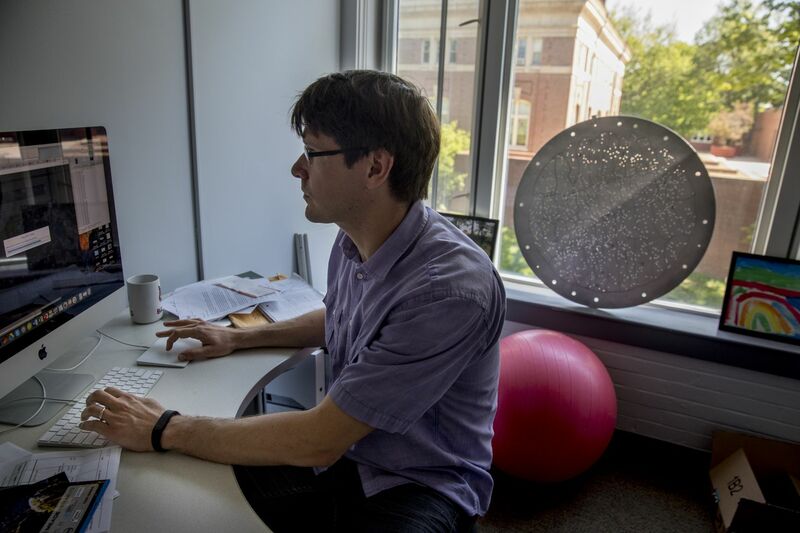 On the window sill of his third-floor Carnegie Science office, Assistant Professor of Physics Aleks Diamond-Stanic has a large aluminum plate peppered with 1,400 tiny holes. It’s nice to know about the view, but what about the plate? While it looks like a crazy pizza screen, Diamond-Stanic’s plate was once used by astronomers with the Sloan Digital Sky Survey, based at Apache Point Observatory in New Mexico, to collect spectra from objects throughout the universe. Each night, the SDSS uses different plates to measure a small part of the night sky, about the size of one’s palm stretched out at arm’s length. Each hole in the plate — corresponding to an object in space, such as a star or galaxy — has an optical fiber plugged into it to measure the object’s spectrum. After the mapping is done, the plates are distributed by request to scientists and educators. The SDSS has used thousands of spectroscopic plug plates in its 14-year history. Diamond-Stanic says the plate symbolizes a connection between his work at Bates and SDSS, a multinational collaboration among dozens of institutions that is creating three-dimensional maps of the universe with unprecedented detail. In fall 2016, Bates joined the SDSS as an associate institutional member. “We get access to proprietary data that is a big part of what we’re working on with the students in our Galaxies Lab this summer,” Diamond-Stanic says. He’s talking about the Bates Astrophysics Galaxy Evolution Lab. The “BAGEL,” as he calls it, uses datasets from telescopes on Earth and in space to study the interactions of gas within galaxies — how gas forms stars and fuels the growth of supermassive black holes within galaxies, and how energy and momentum from massive stars and black holes expels gas from galaxies. In April, Diamond-Stanic took three student researchers — Kwamae Delva ’18, Eve Cinquino ’19, and Jose Ruiz ’18 — to the Apache Point Observatory. There, they designed and executed their own program using the observatory’s 3.5 meter telescope.